Thanks for your interest in my work with animals and in joint venturing with me. We can partner together to support each other in several ways, I’m open to the possibilities. I do need to know more about your project before making a decision about whether this is a great fit for me or not. Please fill out the information below, as is appropriate. Would you like to interview Val or have her be a speaker for your Event (Live Event, TeleSummit/Speaker Series, media appearance, etc.)? Would you like to be a Host or Sponsor for Val’s work? We currently have sponsorships available for The Real Dr Doolittle Show (podcast) and The How To Talk To Animals, The Complete System program launches. Would you like to sign up as an Animal Hearts Friends Affiliate so you can joint venture with us to promote our work (and generate commissions for your cause)? 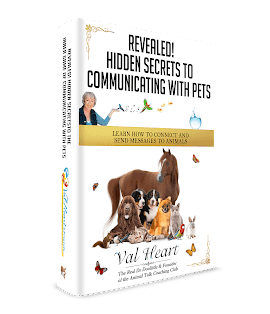 Would you like Val to interview you on The Real Dr Doolittle Show? Do you want Val’s help promoting your TeleSeminar/Webinar, TeleSummit, fundraiser or other launch? Are you interested in co-creating a new program, book or product together (please describe below)? 4. How did you find out about this type of opportunity with Val? 7. If you want Val to promote your product or program, what is the product/program price point? 8. Do you have an affiliate program? If so, what is Val’s affiliate percentage, and, how do we sign up? 9. How many events like this have you done? How many people typically register? How many people are currently registered for the event? How many people are forecasted to register for the event? 12. Please list more details about the anticipated reach of the promotion? If it’s a speaking event (TeleSummit, live speaker series, etc), who else is participating? How many solo mailings will you do? What other methods of generating traffic will you do? 13. Anything else you’d like to share? We’re super open to your questions, comments & feedback about this process – or anything else that comes to mind. Thank you for submitting your response, we will review it in our weekly team meeting and get back to you with our decision within two weeks. Please email [email protected] with any questions or request for higher urgency of review.